Red-legged Partridge (Alectoris rufa). Taken at Bryher, Isles of Scilly, on April 18th 2011. Taken at Bryher, Isles of Scilly, on April 18th 2011. 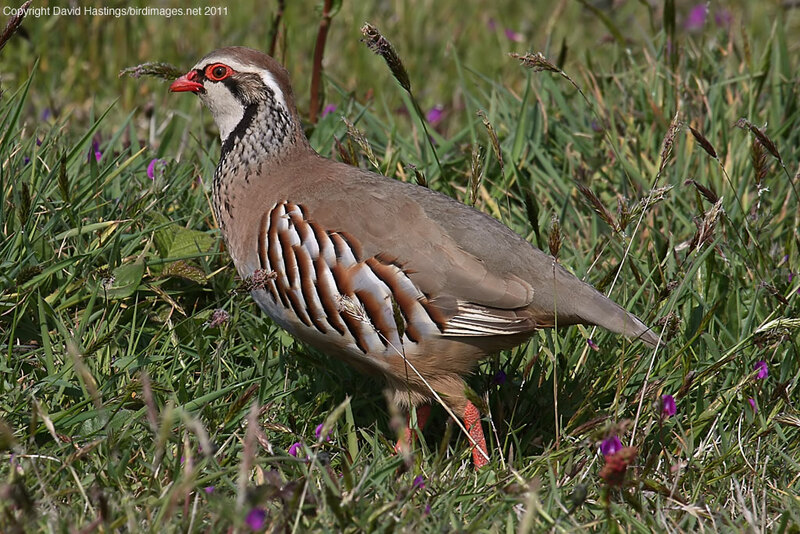 The Red-legged Partridge has a large white chin and throat patch, bordered with black. It has a greyish body with bold black flank stripes, a chestnut-sided tail, and red legs. The sexes are similar. This species is found in France and Spain; it has been introduced to Britain. It is mainly found in southern and eastern England, and eastern Scotland. It breeds mainly in lowland areas, selecting cultivated farmland with pasture, heathland, unworked sandy or stony terrain with low vegetation, and coastal meadows. It is a gregarious species and it often found in flocks. Birds are generally wary and run away quickly when disturbed.